This tab controls basic agent functions. This replicates information found on the sub-subs of the Action Inspector. Edits made on the this dialog are live as soon as the Return key is pressed or focus shifts from the current input box on the pop-over. This popover is shown by default as soon as a new agent is defined. Agent title (only shown if the current object is an agent). The $DisplayName for the agent is displayed above the input boxes. Query. The agent's query (stored in $AgentQuery). Auto-complete is offered for action code terms and system/user defined attributes if stating with a $ prefix. Editing this code is the same as if editing the Action Inspector's Query tab. Action. The action to be applied to each child alias (stored in $AgentAction). Auto-complete is offered for some input - as described above. Editing this code is the same as if editing the Action Inspector's Action tab. Priority. 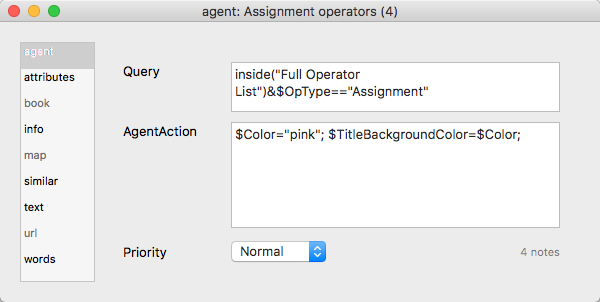 This opens the Agent Priority pop-up list, allowing the agent to be turn on, off or to a non-default working state (e.g. on but at lower priority). Setting is stored in $AgentPriority. Using this is the same as using the Action Inspector's Query tab's Priority pop-up. Result count (only shown if the current object is an agent). The count of matches to the current query is shown in grey text bottom right of the pop-over.